A test explosion on a Boeing 747 has shown that a US Christmas Day flight would have landed safely even if a bomb on board was detonated successfully. The plane's fuselage did not break in the controlled blast, which used the same explosives that were on Flight 253 from Amsterdam to Detroit. However experts said it showed the suspected bomber and the passenger next to him would have been killed. Umar Farouk Abdulmutallab, 23, has denied attempting to murder 289 people. 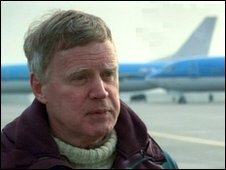 Dr John Wyatt, an international terrorism and explosives adviser to the UN, replicated the conditions on board the Detroit flight on a decommissioned Boeing 747 at an aircraft graveyard in Gloucestershire, England. The same amount of the explosive pentaerythritol (or PETN) allegedly carried by Mr Abdulmutallab was placed to mirror the location where he was sitting on the plane. Dr Wyatt said: "If it was a more rigid material then we might have seen a crack or breakthrough but this is actually quite a flexible material. "I was extremely impressed by the aircraft structure. "It can sustain quite a hefty thump." Captain Joseph said: "We noticed the aircraft had lost some rivets but no flight controls were compromised and certainly no fuel tanks were breached. "I'm very confident that the flight crew could have taken this aeroplane without any incident at all and get it on the ground safely." However, the experts said that the death of the suspected bomber and the passenger sitting next to him would have been traumatic for passengers. "It would have been quite horrific. Obviously the blast itself would cause eardrum rupture," said Dr Wyatt. Captain Joseph said the noise and the smoke would have been awful, "not to mention the parts of the bodies that were disintegrated as part of the explosion". But Captain Joseph said the experiment could help to put air travellers at ease: "I think this should be a confidence-builder for passengers. "After seeing... how well the aircraft maintained its structural integrity, and obviously the pilot's capacity to fly the aircraft, it should give them a great deal of confidence." Kip Hawley, the former head of the US Transportation Security Administration (TSA) said: "We can be sure that al Qaeda and others have taken lessons from their failed attempt and this program allows the public to be privy to some of those lessons. "An active and engaged public can not only be a layer of security but can be more effective in demanding the kind of security that will work. 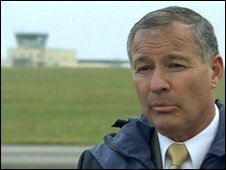 "The explosives analysis done by Dr John Wyatt gave a realistic picture of the effects of a carry-on bomb roughly similar to the one used on Christmas Day. "The point that today's airframes are more resilient than many imagine is a critical point. "Governments do very sophisticated testing similar to what Dr Wyatt demonstrated and those results inform security measures you see in airports today. "Specifically, it was that kind of testing that led to the decision to allow 100ml of any liquid, carried in a sealed one-quart baggie, to be brought through security." Dr Wyatt's test results are to be shared with governments and aviation security experts around the world. How safe are our Skies? 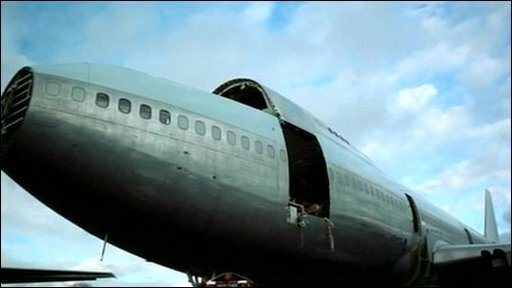 Detroit Flight 253 was broadcast on BBC Two on Thursday 4 March, at 2100 GMT. Watch it again on BBC iplayer. At the time of the attempted detonation, Flight 253 was descending rapidly and its altitude has been estimated to be around 10,000ft. At that height the difference in pressure inside and outside the plane would not have been great enough significantly to affect the explosion. So the explosion team ruled that the decommissioned plane's lack of doors was not a factor in the test. With this quantity of explosive, the peak pressure and impulse are over quickly and decay rapidly over distance. The doors were sufficiently far away that the overpressure would have dissipated before it reached them.